Adcorp economist Loane Sharp estimates SA’s informal economy at 18% of GDP. More importantly, it is out-pacing the growth in the formal economy at a staggering rate. What is going on here? Sharp speculates that companies are opting out of the formal market and moving into the informal sector to evade taxes, regulations, paying medical benefits and the like. They would rather employ workers in the underground economy and pay them cash than deal with the layers of bureaucracy that confront formal sector businesses. The truth is that SA is a highly taxed country, says Sharp. The only way to reduce tax evasion is to reduce taxes. This may also explain why company liquidation stats are falling. A lot of them simply closed some years ago and went informal. Government cannot possible create the millions of jobs needed to absorb the informal sector, however much it would like to tax and regulate them. Also bear in mind that the informal economy is where millions of South Africans gain skills that they can then exchange for cash in the market. They acquire business management skills and the more adventurous often graduate to the formal market (witness Herman Mashaba, founder of Black Like Me). James Hall, writing for the Activist Post, argues that shadow commerce (another term for the informal economy), as practiced throughout the world, is the real economy. “With the acceptance of instruments of credit, the banking system has become more of a tax reporting service than a financier of a healthy economy. The taxman would have you believe that voluntary transactions in cash constitute a black market in illegal dealing. Casting the aspersion of seedy activities upon the motivation to subsist is a common practice of governmental revenue agents. “Building upon this attitude, a deceptive title to a USA report, $2 trillion underground economy aids recovery, would have you think constructive criticism returned to the mainstream press. Sorry to disappoint, you can always count on the Gannett media to be a government mouthpiece. 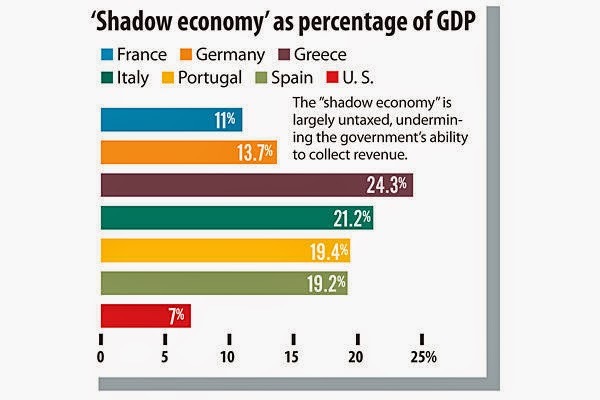 Shadow economies are usually associated with illegal activity, such as drug dealing. But anecdotal evidence indicates that off-the-books work in today’s job market includes personal and domestic workers, such as housekeepers and nannies. People are running out of patience when it comes to finding a job and losing income,” Gonzalez said. “So it’s not that surprising to have workers take jobs that are in the shadow economy. But it’s a sign of how bad things are and how we have to get the real economy moving again. 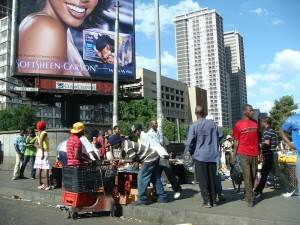 Perhaps we should celebrate rather than pity the informal sector. It is a vital safety net for those excluded from the formal sector. Skills honed in the informal sector will allow the most vulnerable to participate in the economic life of the country, and many will eventually graduate to the formal sector.